I love this because you can simplify it to be finished in about an hour or you can spend a little more time to have a completely custom look! Want to know the best part? It only cost about $3-5 per pillow sham! $3 white pillow shams Gurli from Ikea. I decided to purchase the colors that I didn’t have and also use leftover latex paint with fabric medium so that it would be washable after heat setting. 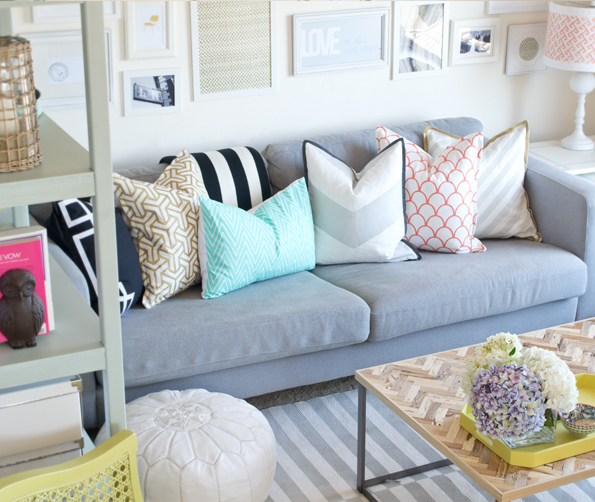 For my inspiration, I turned to my Pinterest boards (always a great way to see trends that you like!) 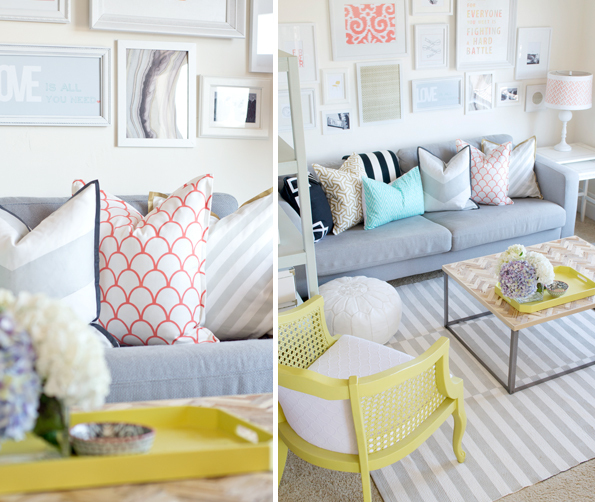 and picked the a few designs that I loved from Caitlin Wilson Textiles and Sarah Swanson’s home. I started with two striped designs. It really doesn’t get easier that this! For the diagonal stripes, I didn’t even have to measure! 🙂 I simply determined the width between stripes and offset it with two pieces of tape to keep the line straight and then laid the next piece of tape. For the wide chevron, I did measure, but still super simple! The most important thing is to press the tape down firmly so that the paint doesn’t seep underneath the lines. Then I mixed up my paint, dipped my roller in, rolled off the excess (also important to get clean lines) and rolled away from the painter’s tape to avoid build up around the tape. After that dried, I created an inexpensive trim by taping off the edge and brushed on a contrasting color. Now for my favorite part! I decided to create my own stencils based on Caitlin Wilson’s Hong Kong and Scallop fabrics. I drew the patterns in Adobe Illustrator and cut the stencil on my Silhouette Cameo with Grafix Craft Plastic (see Amazon link above). 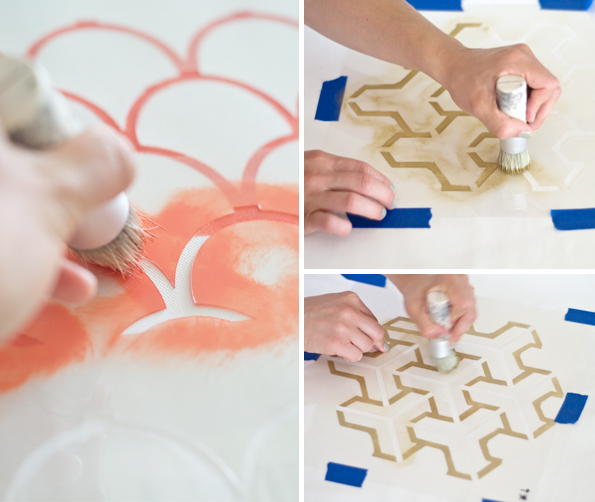 You could also pick up a few stencils at your local craft store for a simpler method. I’ve been making stencils for about a year and have learned that not everything can be easily translated into a stencil. To get the thin gold lines instead of a gold fill on the Hong Kong inspired stencil, I created a two part stencil, the first to capture the outer edge of the cube, and the second to finish the inside. A little extra effort, but I was able to achieve the exact look I was going for, so definitely worth it! 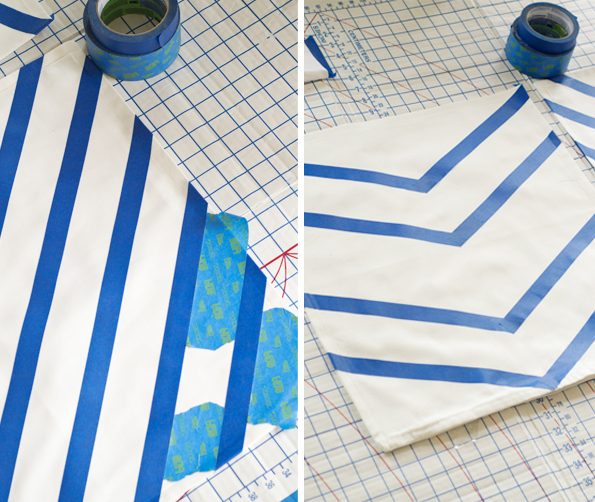 If you’ve never stenciled before, here are a few tips. 1. 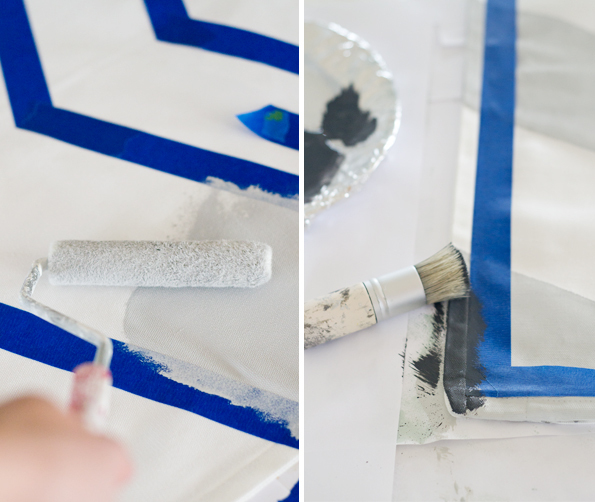 Lay and tape paper over your table, tape the sham down, center the stencil and use painters tape to secure your stencil in several places to avoid it moving 2. dip your brush in paint and wipe off excess on a paper towel before starting, you want a small amount of paint on the brush to avoid it going underneath the stencil. 3. Hold the stencil down with your other hand as you go to prevent it from coming up 4. Carefully line up the next row so that the pattern stays consistent. 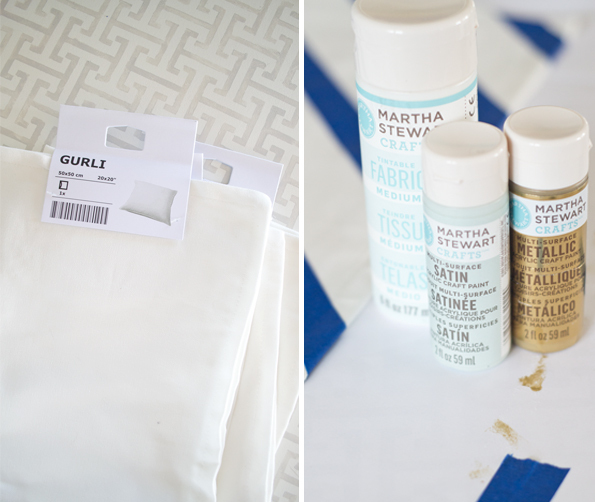 Allow the paint to dry completely and heat set with a white cloth between the pillow and iron on a low setting. I decided to mix the painted shams with my DIY greek key sham and a pillow made out of the left over fabric from my Mid Century Modern refurbished chairs, Caitlin Wilson’s tall mint chevron. I didn’t paint the backs, but that would be a great way to add a contrasting color or pattern to have a reversible sham! 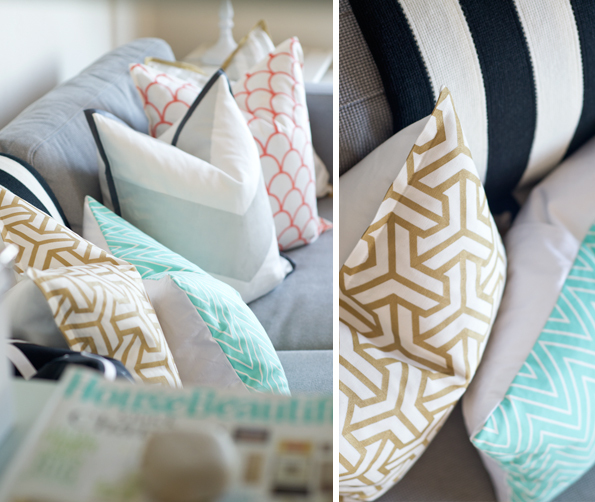 I’m loving our new pillow shams! Most of all, I LOVE the price! 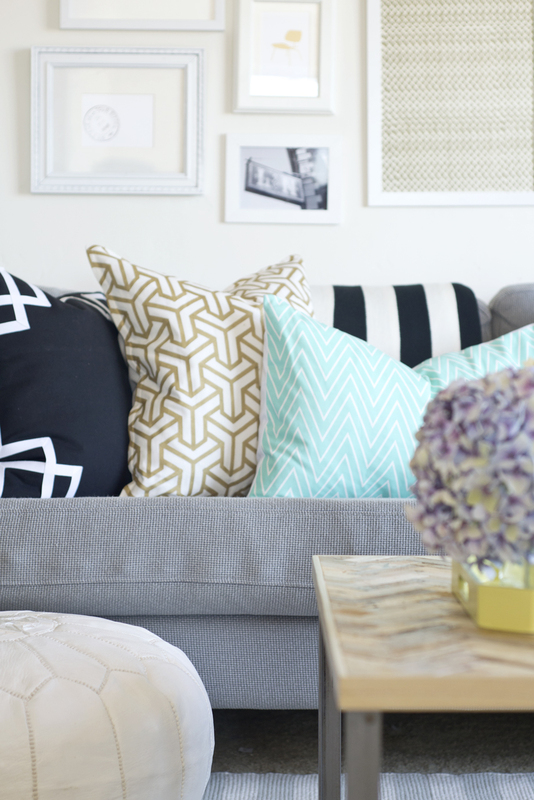 I had the fabric for the mint chevron pillow left over and the Greek key sham was a previous DIY, but this project could be easily done for under $30 depending on your fabric selections! Other DIY projects in the room, chartreuse caning chair, herringbone driftwood coffee table, painted offset striped rug, custom shelving for $35, nesting tables with a greek key top, milk glass lamp with stenciled shade. Feel free to browse my project’s page or my Etsy shop for more inspiration!